Losing valuable data or exposing sensitive information may be the most frightening thing that can happen to a business. Once customer trust is lost, bouncing back from that kind of disaster can prove costly and difficult, if not impossible. eXpd8’s solutions from our chosen partners can help you and your firm to avoid these threats and help you to safeguard your business. Stop email threats outside your network using cloud-based adaptive filtering. Protect, detect and destroy malicious computer viruses before they harm your device or data with Symantec Endpoint Protection. Backup your data online, giving you peace of mind that your information is secure and safe. Over a 25 year history, SonicWall has been the industry’s trusted security partner. With over a million security devices in almost 200 countries and territories worldwide, SonicWall enables its customers to confidently say yes to the future. Awareness and understanding play a vital role in the protection of a business from cybercrime. It is very important that all members of staff are aware of and educated about the risks of cyber security and the latest scams to ensure that your firm is protected from these cyber-attacks. 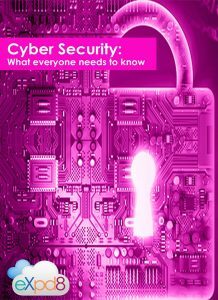 eXpd8 have developed a Cyber Security Awareness booklet containing all the relevant information that can assist you in ensuring the protection of your business from cyber criminals. You can download this booklet here. Although this booklet will help improve awareness we strongly recommend that you take control and train your workforce today. eXpd8 can offer an in-depth cyber security awareness training session to your staff in your office. Visit our training section for more information.